The flamboyantly coiffed female modified her appearance with a disguise in order to assimilate. 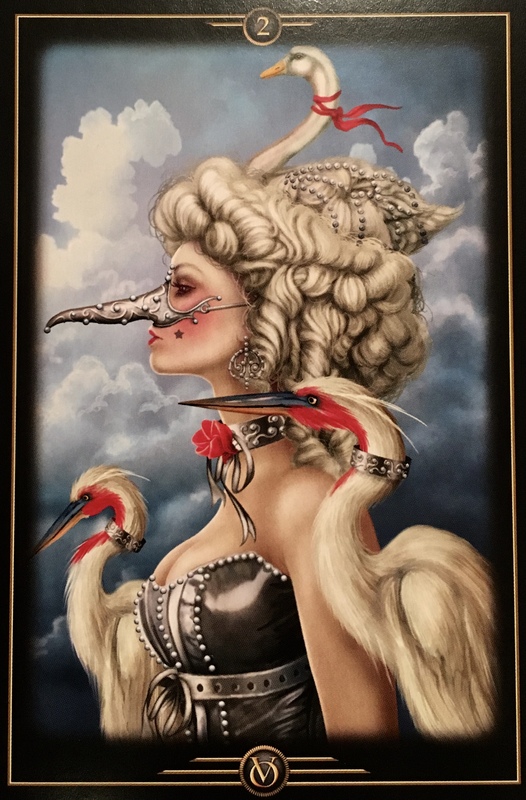 The masked beak transforms her visual persona, and her poise and means of posture further confirm her spiritual transformation. She is at one with those she has joined. Is there a situation in your life in which, or a person to whom you are wearing a mask to camouflage your true feelings? Are you putting on a brave face, turning away from the pain, ignoring it in order to fit in or to placate another? Maybe there is a compromise in which you feel someone has stepped uncomfortably into your boundaries? Whatever the case, it is time to step back into your power. And the only way to do this is through honest and clear communication. You may need clarity first. You may need to figure out how you really feel before you can explain it to another. You may have buried the resentment so deeply at this point that it will take a bit of soul searching to bring it fully into the light. No more pretending that everything is just fine when it isn’t. This will only make the wound fester. As you ascend in your own consciousness, there may be things that we ok at one point which are no longer aligning with you now. Acknowledge them and commit to making necessary change. Not everyone may accept the news easily; there may be some challenge as there will be those who wish to keep you exactly where you are. But this is necessary for your own growth, and your sanity too! You simply cannot continue as you are without causing more pain in the long run. Dealing with it now, with honest, integrity and compassion is the only way. Do not fear this change, embrace it for even though it may cause some discomfort, it will ultimately set you free.